Several items from a Spanish galleon shipwreck have been recovered including a 7 foot anchor. 5 men were arrested and have posted bail. Ring allegedly taken from the slain body of Tipu Sultan at the end of the 1799 Srirangappattinam battle. Various groups urged Christies to halt the auction but it went through. The ancient statue looted from Koh Ker and held in the Norton Simon Museum for decades has officially returned home. More on the return of the Norton Simon Bhima. A 4 minutes radio piece on the situation in Syria. University in Van has made a catalogue of 200 Urartian artefacts in foreign museums that they hope to have returned. Short news spot interviewing Monica Hana about looting and Ali Ahmed about the recovered artefacts now on display in the Egyptian Museum. Mostly info that has been published elsewhere before this. As I usually say, why isn’t this article demonising eBay as a vector for these illegal sales? Why is it always the archaeologists’ fight against sellers, ignoring the medium? Ebay could swiftly ban all antiquities sales, but it doesn’t. That is the story. Employes of the commercial salvaging company Aqua Quest International have been arrested in Honduras on illegal weapons charges. They were salvaging historic mahogany logs which still have commercial value. Since 2000 sacred art stolen from churches is looted/trafficked more often than archaeological objects. 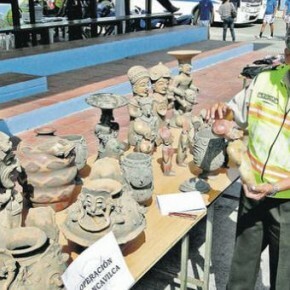 Reps from Mexico’s INAH say that the tourism company Explorean Kohunlich are encroaching on the site of Chacanbacán and this may be causing looting. A Florida pastor discovered his Hirst paintings were fake but sold them anyway. Looters holes have been found at two of Finland’s Iron Age sites: a graveyard associated with Rapola Castle and Hakoinen Castle. Piece on Rabbi Shlomo Koves who is seeking the return of item taken from Hungarian synagogs during the Holocaust. A piece about Patrick Vialaneix who claims to have become obsessed with the Rembrandt painting Child with a Soap Bubble and, as an alarms tech, stole it in 1999. More on the Rembrandt theft. Following a 5 year legal battle, Spain won the silver treasure of the Nuestra Señora de las Mercedes wreck from the commercial salvage firm Odyssey Marine. Spain (and this blogger) consider the items to be looted. Man pays €300 for van Meegren’s death mask. A steal! We can only hope they are!